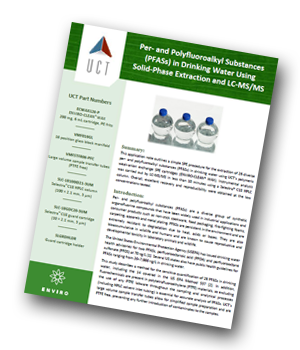 UCT has produced an application note outlining a simple solid-phase extraction procedure for the extraction of 26 diverse per- and polyfluoroalkyl substances (PFASs) in drinking water using UCT’s polymeric weak-anion exchange SPE cartridges (ENVIRO-CLEAN® WAX). Per- and polyfluoroalkyl substances (PFASs) are a diverse group of synthetic organofluorine compounds that have been widely used in industrial applications and consumer products such as non-stick cookware, food packaging, fire-fighting foams, carpeting, apparels and metal plating. PFASs are persistent in the environment and are extremely resistant to degradation due to heat, acids or bases. They are also bioaccumulative in wildlife and humans and are known to cause reproductive and developmental toxicity in laboratory animals and wildlife. The United States Environmental Protection Agency (USEPA) has issued drinking water health advisories for two PFASs, perfluorooctanoic acid (PFOA) and perfluorooctane sulfonate (PFOS) at 70 ng/L. Several US states also have public health guidelines for PFASs ranging from 20–7,000 ng/L in drinking water. To avoid any potential contamination with PFASs, water samples should not be collected in a fluorinated plastic container. Glass should also be avoided as it has been reported that certain PFASs can be retained on its surface. A polypropylene or polyethylene container is the most suitable option. PFASs are ubiquitous in the laboratory environment, mainly through the widespread use of TeflonTM components in analytical equipment, including HPLC. In order to avoid high background in LC-MS/MS analysis, the TeflonTM solvent lines should be replaced with PEEK tubing. However, PFAS contamination is difficult to completely eliminate and depending on the analytical conditions used, any PFAS present in the mobile phase, solvent lines and online degasser can become concentrated in the analytical column and be detected at the same time as the injected sample analyte. To overcome this, a short C18 “delay column” is commonly installed after the solvent mixer and before the sample injector to separate the contaminant peak from any PFAS present in the sample. This application note outlines a simple SPE method for the determination of a wide range of PFASs in drinking water using LC-MS/MS with a Selectra® C18 column. The results indicate that UCT’s polymeric weak-anion exchange SPE cartridges (ENVIRO-CLEAN® WAX) can be used to simultaneously extract 26 PFASs in drinking water at environmentally relevant concentrations. All PFASs were quantified with good linearity of calibration using 6 mass-labelled internal standards. The recovery and RSD values obtained were within the acceptance criteria of the EPA method 537. The method can also be used as a starting point for a custom method that is tailored to a specific matrix or additional compounds. In this case, further optimization of the method can be carried out to optimize results.